Rev Al Bailey II; Bishop Walter S Thomas Snr; and Odell Dickerson of the New Psalmist Baptist Church, Baltimore. Green Parishes: The Lutheran Church of Norway will in 2017 be celebrating 500 years since Martin Luther nailed 95 theses to a church door in Wittenburg, Germany, and thus started the Reformation. The Church has pledged that by 2017 all parishes will be green parishes, and each joint church council will be certified as an ‘environmental lighthouse’. CO2 Reduction: The Church of England discovered, in a 2007 audit, that the national carbon footprint of its 16,200 churches as well as clergy houses, halls and offices was 330,000 tonnes of CO2. It has pledged to reduce this by at least 42 percent by 2020, and by 80 percent by 2050. Tree planting: The Northern Diocese of the Evangelical Lutheran Church of Tanzania is implementing an intensive tree planting campaign, with 8.5 million trees to create community forests across the region, at a cost of US$2.5 million, of which two thirds will be raised locally. Water saving: The Greek Orthodox Patriarchate of Antioch and All the East is promoting water saving devices in all Church institutions and in all Orthodox homes. This is particularly important in water-scarce countries in the Middle East. Food and produce: The Polish Autocephalous Orthodox Church will set up a new food regime in its Suprasl Academy to ensure that more than 70 percent of ingredients in the refectory kitchen will be fresh, local and organic. This is part of a wider plan to promote organic farming in Podlasie Region. Investments: The Church of Sweden diocese of Vasterås has helped create a fund, in which it has also invested, which grows sustainable timber in a deforested and impoverished area of Mozambique. As well as commercial forestry the ‘Global Solidarity Fund’ involves reforesting an equivalent area for wildlife, and building a timber mill in which a local labour force is employed. 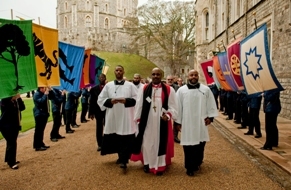 The Church of England diocese of London is also an investor. Spiritual reflection: The Catholic Bishops’ Conference of England and Wales has pledged to ‘develop a sense of awe and wonder for creation in our young people through all subjects and ground them in a spiritual awareness of the need to care for Creation.’ For example, on ‘Earth Day’ in 2008 the timetable for the entire day at All Hallows Catholic preparatory school in Somerset, centred around ecology. It included cleaning a stream and having a lesson in the insect-life found in it; dyeing with natural ingredients; making prayer flags on which environmental prayers were written. Sacred land: In 2000 the Maronite Church in Lebanon made its portion of the fragile and precious Harissa forest into a Maronite-Protected Area. The town of Jounieh and three landowners all voluntarily joined the scheme, losing themselves the chance of considerable money being offered by developers. Education: The Evangelical Presbyterian Church of Ghana is providing training in the manufacture of energy-efficient stoves, as well as providing training in fire fighting and in sustainable livelihood programmes like snail farming and bee keeping. Media: The Armenian Orthodox Church runs the Shoghakat TV company which in 2010 is launching the Green Theology project to broadcast environmental programmes. Celebration: The Society of Jesus (Jesuits) are considering introducing a new annual environmental celebration to commemorate the anniversary of the inspiring French Jesuit priest, palaeontologist and environmental philosopher, Pierre Teilhard de Chardin SJ, who died on April 10, 1955. CAFOD (Catholic Agency For Overseas Development) Seven Year Plan. Catholic Bishops' Conference of England and Wales Seven Year Plan. Catholic Coalition on Climate Change Seven Year Plan. Catholic Earthcare Australia Seven Year Plan. Church of England Seven Year Plan (launched at Lambeth by the Archbishop of Canterbury on October 29). Church of Norway Ten Year Plan. Church of South India Seven Year Plan. Evangelical Lutheran Church of Tanzania Seven Year Plan. Evangelical Presbyterian Church, Ghana,Seven Year Plan. Greek Patriarchate of Antioch and All the East Seven Year Plan. New Psalmists Baptist Church Seven Year Plan. Orthodox Church of Poland Seven Year Plan. Patriarchate of Alexandria and All Africa Seven Year Plan. Presbyterian Church of Cameroon Seven Year Plan. Religious Organisations Along the River (ROAR) Seven Year Plan. Vineyard Evangelical Seven Year Plan. THIS PAGE IS STILL BEING ADDED TO.